It's been all go here lately. Whilst I've been prattling on and pretending everything is ok (except when I'm alone and then I have a good cry) there's been some serious stuff happening. One of our clan is unwell. Quite seriously unwell. The thing is this... Anything happening to him is just not an option, as drawn up by his children and grandchildren and signed forthwith. Wednesday was a big day. It was a day I needed some company and something to keep me busy while we were helpless and waited for news. 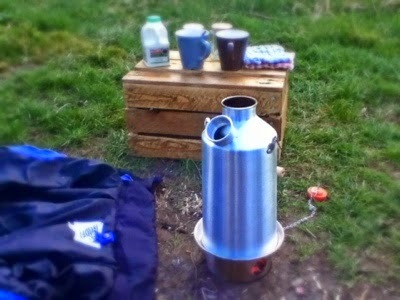 As luck would have it M had a day off and we devised diversionary tactics by taking our brand new Kelly Kettle out for a test run. I like this gadget for it's sound eco principals. All you need is a handful of twigs to make a small fire in the base. That's enough heat to boil the water in the double walled part in about three minutes. It does what it says on the box. What it doesn't say on the box is that it might be tricky to find a suitably remote lay by with no passing traffic in order to try it out in a public place without getting into trouble. We did eventually find the perfect spot and quickly set to lighting the fire. I gathered some dry twigs, leaves and small pine cones. Harvey was a big help with this activity. It took two attempts to light and it did smoke a bit at first but it got going with that hole at the bottom facing the wind (you can just see the orange glow of the fire). We've invested in this kettle as a way of providing boiling water as and when we need it at the many (and this year even more!) cricket matches we'll be attending. Flasks don't last as long as my desire for hot tea unfortunately and then it gets expensive buying it all afternoon. It's also a bit of camping style fun. We'll need to take one of our small round concrete slabs so that we don't burn any grass and more than likely we'll have to sit in the furthest away corner of the boundary but apart from those two things I think it will be a success. Wednesday went as well as could be expected and the next three months will involve me crocheting a number of man beanies to cope with the loss of hair. I doubt he'll wear any of them, I can but try. Any good patterns along the way will be made in multiples because I've recently decided to embrace grey hair by growing out my dyed hair. It's been going grey since my twenties and I think I might be quite white now. I've no idea what I'll find underneath so I'm quite intrigued to know. I'm impatient and the quickest way to get things going was to chop off as much brown as possible, so I've recently had a pixie cut. I think I'll be wearing hats for a big chunk of this process though, it's not the hair cut I want to hide but what they call the 'skunk' stripe. Scary. Naturally my daughter can't begin to understand why anyone would want themselves to look older but then she's never really been as eco minded as I have. At her age she cares what others think, at my age I'm past caring, in fact it's liberating because I just want to be me. Whoever that is once you've taken out the mum and wife bits.